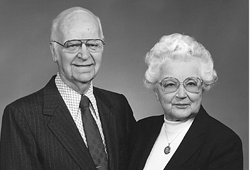 Myron 28 and Bernice 28 Kem have been very generous in service and with their financial resources to Ashland University during their lifetimes. They left a special gift through an estate plan to Ashland University via a Donor Advised Fund at the Dayton Foundation. Bernice had not only added to their scholarship program funded at Myrons death, but began an endowment program for the campus residence hall named in their honor. That endowment will continue to grow for many years to come as their son, Richard, and his wife, Carla, and grandchildren, Christa and Michael, participate in their familys continued commitment to Ashland University.